Comm Eye Health Vol. 31 No. 103 2018 pp 75. Published online 09 November 2018. 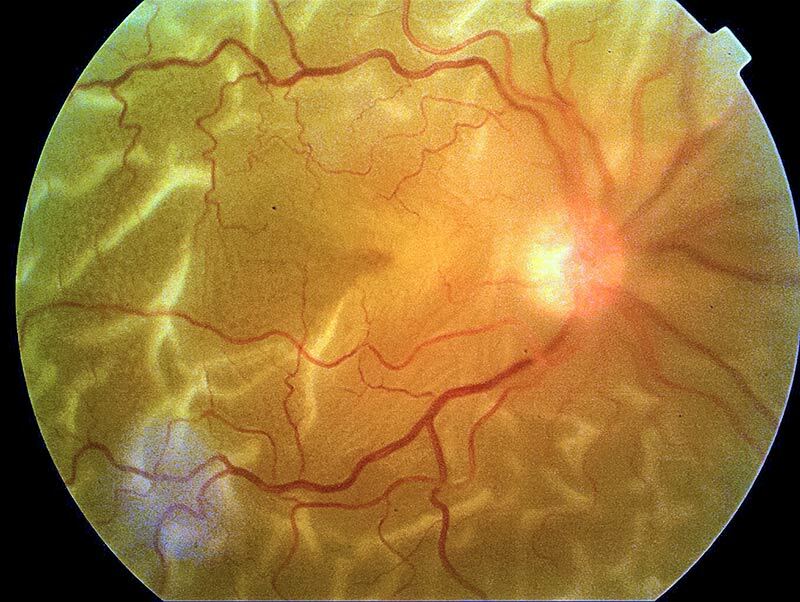 This is a fundus photo of a 60-year-old man, who had successful cataract surgery three years ago. His visual acuity is hand motions, and he complains of sudden, painless loss of vision in his right eye two weeks ago. What clinical signs can you see? 1) All false except d.
2) a., b. & e. are true. c. & d. are false. The disc margins are slightly blurred. This is because they are out of focus. The retina is detached, so it is in front of the disc, which means either the disc or the retina will be out of focus in fundus photos of a retinal detachment. 3) All false except b.